Testimonials from Hedonisian Volunteers and Guests! If you know of any media or press who might be interested in the Hedonisia story please let them know us know so we can send them a Press Release! 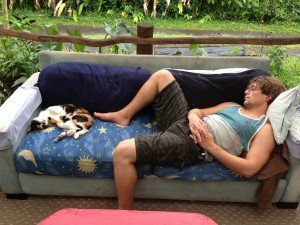 All the Rooms: Unique Hostels You Have to Experience! How I love you! Thank you all for being so great. Thank this crater and this land, learning earth magic, and hearing the green sea speak. What a warm, welcoming, wonderful place Baba Mojo has taken on a ship from floating visions to galactic action. Peace! And thanks! Thank you for all the good things you have shown me, i learned valuable knowledge, i felt safe and cared about, I enjoyed the experience and loved the people i met at Hedonesia. I admire all the love and energy you put into the eco village. I appreciate the time you spent teaching me, i appreciate the interns…. Seriously grateful. You have an incredibly warm place in my heart. I will miss you all so SO much, and I will think of you each time the beauty you have shown me is reflected in my thoughts and actions. Thank you for a nice stay in the Bamboo Bungalow. I’ve enjoyed listening to the frogs and being in the jungle. Take care! Thank you so much for all my memories of living in such a positive place… We may sit and stare a lot, but I found myself richer for the experience than I imagine I would have trying to fill all the gaps of time with mindless activity. There is a much more stable atmosphere here in which to be your own person rather than automatically becoming part of some group. I am truly thankful for that and happy that Hedonisia makes it work. I’ll be anxious in time to come see what direction the hostel moves in and hopefully come volunteer again. Thank you all for being a part of my trip here and making it such a good one. You’ve got a great place growing here! Keep up the love and nurturing. Groceries are donated. My time has come to a close here. It has been one of the most eye-opening and beautiful experiences of my life. To meet each of you and share moments of joy, fear, love, uncertainty – all of it has been such a pleasure. I’ve been contemplating all of the souls I’ve connected with while here, and everyone has left their mark – no matter how big or small – on my mind, heart, and spirit. It fills me with immeasurable happiness to know that I have a kooky little jungle family in Puna that loves me for better or worse. I sincerely hope I’ve left a favorable footprint in all of your hearts and on Hedonisia’s spirit… I will always retain what I learned here and take it with me. I’ll stay in touch and before long I’ll be back for a visit. Take care of yourselves and enjoy this awesome paradise. Thanks for the cover and the great party! If you ever come to Finland just let me know and I’ll hook you guys up! 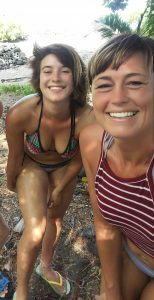 I wanted to take a moment to recognize and give thanks to your parents for bringing to the earth such an amazing soul and wonderful friend. Thank you for all your love and support during my floater hippie days…and also being a supportive and loving ear for the more challenging times. You create a very safe and awe inspiring environment for the unknowing traveler. My experience at Hedo is what made me feel I needed to be on the Big Island during my pregnancy. I had wonderful and awakening times on my journeys here. Thank you so much for all the love and support and for the wonderful space you created! Thank you for an incredible experience out here on the Big island! We could not have asked for a better time. Best of luck to you ALL in your aspirations and endeavors!!! Diego – A Swiss Volunteer in Hawaii! A note of thanks for all the fun and beauty of Hedonisia – as well as the awesome opportunity to be of science and use my gifts! I’m grateful and look forward to the next adventure to the greater Puna. I’ll leave you with these goodies from Burning Man for your contemplation, and to orient you a bit for when you make it next year! Thank you so much for the opportunity to stay at your beautiful place! My only regret is that my stay was so short, but I hope to be able to return for much longer in the future. I really valued my time here, and the company, conversation, and aloha everyone sharesa. May we meet again soon, braddah. 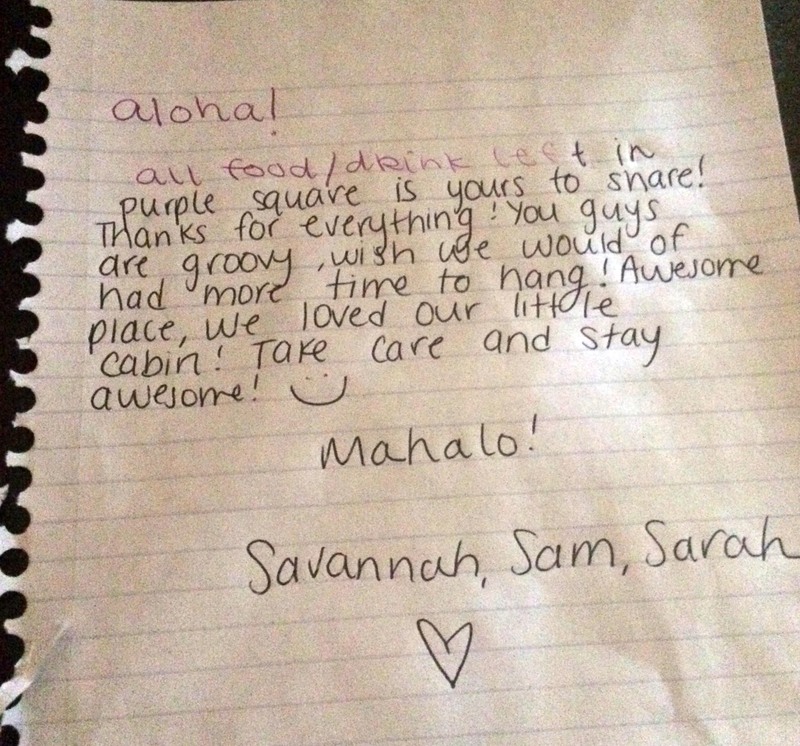 We had a spectacular visit to Hawaii & it was enhanced by each one of you. Thanks for being so welcoming & making us feel a part of this community. It was great to get to know everyone & hear so many different stories. We’ve been inspired to keep traveling & hope to see you again along the way. Let us know if you’re ever on the mainland! Thank you all for allowing me into your home and lives. I lay down last night and realized things in that bliss before sleep comes. I have chosen to journey on and set out to catch the day’s first bus. I’m sorry to leave suddenly, ‘I don’t know why, you say goodbye – I say hello’ and I hope our paths cross again. I’ve lightened my backpack considerably and I hope someone will use these things. You have something wonderful here in a magical place. Thank you for showing me. Thank you so much for everything here! I really enjoyed staying and I’ve learned so much here. This place is a big part of my Hawaii experience and I’m glad I came… Hope to see you again one day! Give me a call when you’re in Germany! It was wonderful meeting, knowing, sharing time and energies, loving, trusting, learning, believing, hoping, and manifesting dreams with you all. I love you. I pray for your happiness and well being. Peace be with you all! I’ll be back to see you again, mark my words. 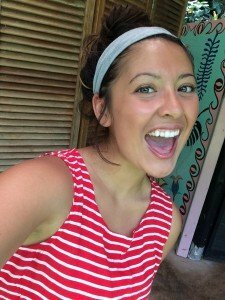 2015 Intern Mary, 20, Boston MA – I came to Hedonisia Hawaii in April 2015, and stayed here as a residential intern for 3 months. I chose to apply to the program because as a business major, I felt that this experience would broaden my work experiences while also qualifying me with hands on business management experience, in an environmentally conscious environment. This experience was a milestone for me, and I would absolutely recommend applying!